Gold produced at Evolution Mining Limited’s Mt Rawdon gold mine in Queensland was used by ABC Refinery, to make Australia’s most iconic horse racing trophy - the 2018 Lexus Melbourne Cup. Meet the everyday Aussies who made it happen. The ABC Refinery team carefully piecing the 2018 Lexus Melbourne Cup together. With most trophies today made by machinery, the Melbourne Cup is a stand out as it contains 44 pieces that are hand spun over a 250-hour production process. The difficult and complicated method is similar to that used hundreds of years ago and includes dozens of people - miners, refiners, chemists, metal workers, jewellers and project managers. “The Cup’s made by hand, but it has to be made perfectly,” said ABC Refinery’s Chief Operating Officer, Paul Cochineas. During it’s global tour, the 2018 Lexus Melbourne Cup made it’s way back to Mt Rawdon. “Exactly the right weight, exactly the right dimensions, within a tenth of a millimetre,” agreed ABC Refinery’s Managing Director, Phillip Cochineas. With over 150 years of tradition and millions of people watching, there’s a bit of pressure to make the iconic 18-carat gold trophy valued at $200,000. To begin, gold was sourced from Evolution Mining’s Mt Rawdon operation, near Bundaberg in Queensland. ABC Refinery’s Paul and Phillip Cochineas, with Victorian Racing Club’s Racing Engagements and Cup Tour Manager Joe McGrath, celebrating the making of the 2018 Lexus Melbourne Cup. Evolution Mining’s Executive Chairman Jake Klein is proud to make Australia’s most prestigious trophy, for the race that stops the nation. “On behalf of our 250 people at Mt Rawdon and more than 700 people across Queensland, it will be a real thrill to know that Australia has stopped to watch horses from around the world compete for a trophy with its origins near Mt Perry within the North Burnett Regional Council area,” said Mr Klein. Evolution Mining’s Mt Rawdon team capturing the moment the 2018 Lexus Melbourne Cup came back to site. “We are so stoked and proud to be part of the company that has come together to make the Melbourne Cup,” said Evolution Mining’s Community Relations Officer Anita Ward. Geologists were tasked with mapping the deposits of gold, before explosives were drilled down under the surface. Once the blasting team had fired their shots from a safe distance, diggers entered the Pit to cart the enormous rubble up the ramp into a crusher. The crusher got the boulders down to a more reasonable size of rock, which were then taken to a processing plant where tumblers smashed them down to a fine powder. The powder soaked in liquids to dissolve the rock, leaving behind the precious metals. The metals were melted and cast as ‘doré’ bars - ugly upon first sight, but worth millions. The doré bars were then taken to ABC Refinery in inner Sydney, New South Wales. Here, the doré bars which were a mixture of metals must be refined. This process includes smelting to purify the gold. The refining process may happen several times in order to achieve 99.99% purity. The gold was handed to metal fabricators who rolled it down into thin sheets. The gold sheets were then taken to W.J. Sanders, where a Spinner carefully bent and shaped them on a lathe to make all the pieces of the Cup. “Spinning trophies is rare these days… and for good reason, it’s difficult. There aren’t many Spinners left,” said ABC Bullion Senior Project Manager, Steve Lowden. The Spinner had to anneal the gold as he worked to ensure it didn’t crack as the gold hardened. If the sheets cracked, they’d be ruined and must be melted down again. “This is the hardest trophy I’ve had to spin, and the most important. It’s the Melbourne Cup mate. I don’t want to bugger it up,” said W.J. Sanders Spinner, Keith King. After the Cup was spun, the other pieces were also made, including the three handles. Then the Cup was polished, engraved and finally, assembled on a wooden base. Following a long-standing superstition that prevents anyone from touching the Cup with their bare hands until the winner, the Cup was hand delivered using gloves to the Victorian Racing Club’s Racing Engagements and Cup Tour Manager Joe McGrath, who carefully assessed the Cup. An additional 58 trophies were also crafted: for the winning jockey, trainer, breeder and strapper, as well as each entrant and town that was included on the Cup’s global tour. 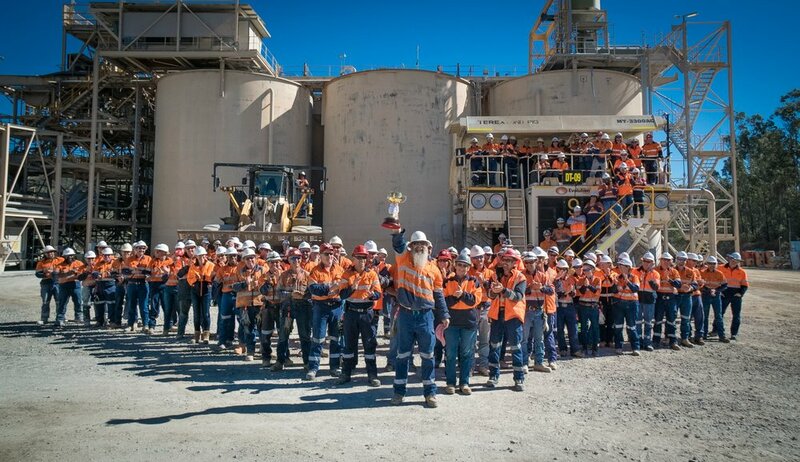 This is the third consecutive year that Evolution Mining and ABC Refinery have partnered to make the Melbourne Cup trophy, but the first time the gold has come from Mt Rawdon gold mine in Queensland. 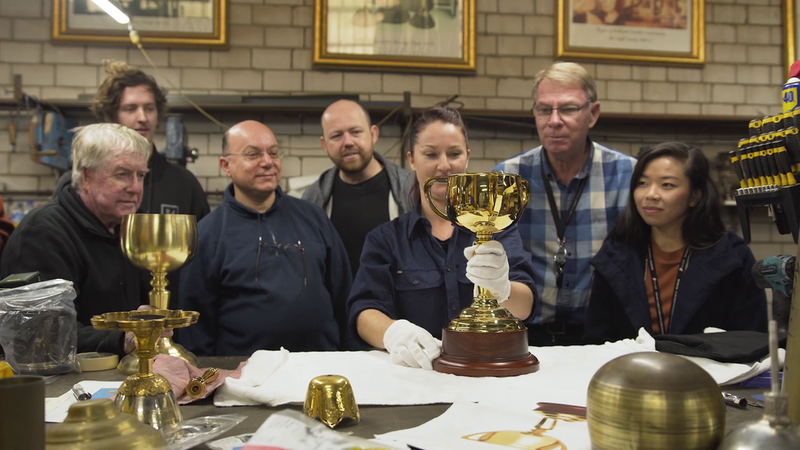 Since 2003, each year’s Melbourne Cup has traditionally made an annual tour, giving members of the public the once-in-a-lifetime opportunity to experience the glistening Cup firsthand. This 2018 tour visited 37 destinations around the globe, including 400 regional, rural and metropolitan destinations, was accompanied by a number of racing greats including two-time Melbourne Cup-winning jockey John Letts, and at one point came back to the Mt Rawdon gold mine and Mt Perry community. Now meet the people who made the Melbourne Cup.